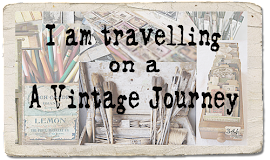 A Vintage Journey: Destination Inspiration - Can You Feel It? Hello Vintage Journey enthusiasts! 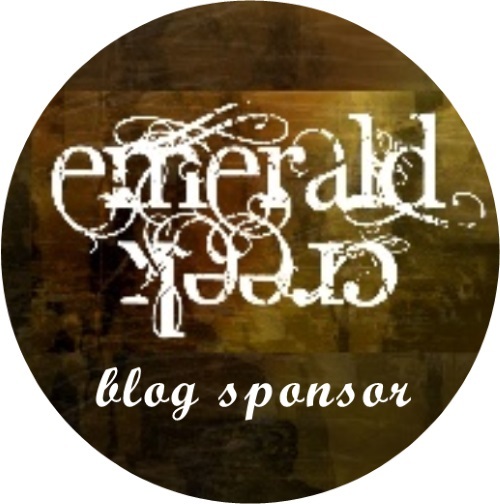 Julia here with my very first Destination Inspiration post. 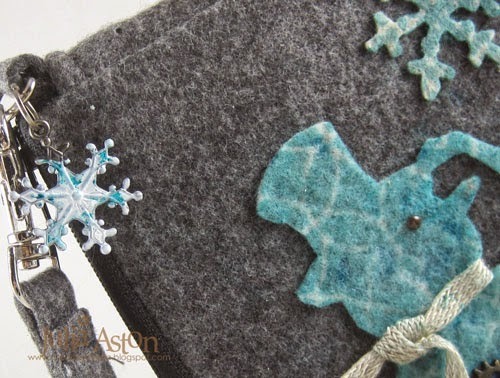 Today I'm playing with felt - seeing how Tim Holtz products work with it. 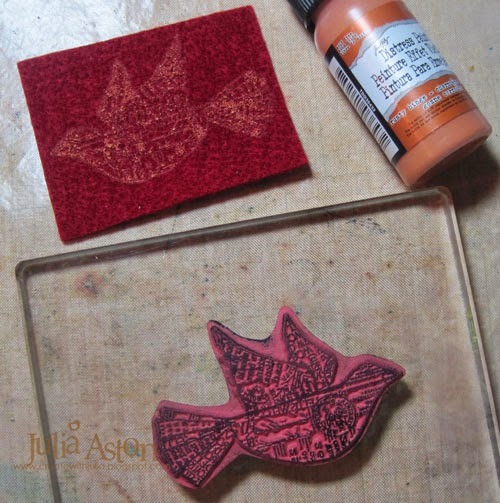 I'm always looking to use my stamping supplies in new ways. So let me show you how I've played with felt and several things "Tim"! I also have a few felt projects to share at the end of my post. NOTE: I decided on the topic for this post in January and started working on it then - I had never seen Tim use felt so I was a little nervous doing this post - and then, Lo and Behold!! 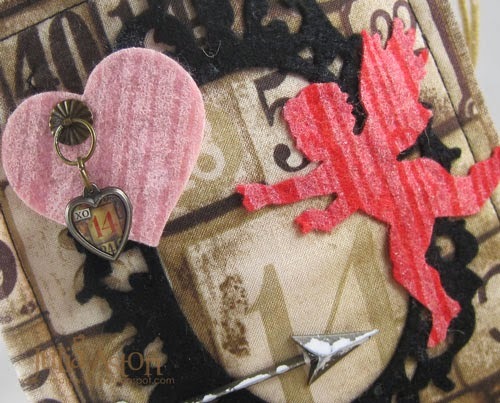 Tim used a die cut felt heart on his Feb 2015 tag - then I felt much better!! 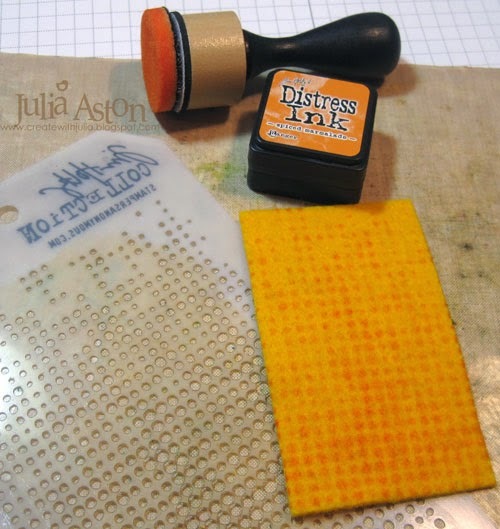 Next I sponged Spiced Marmalade Distress Ink through the Dot Fade Stencil onto orange felt. This came out nicely as well! 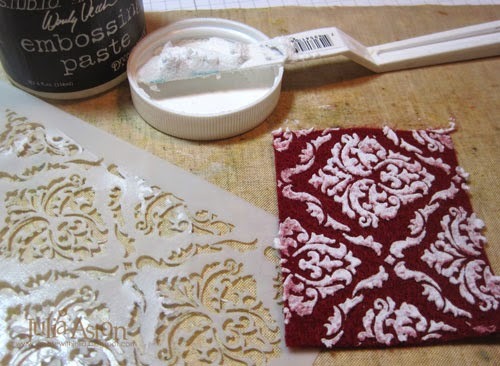 For my third experiment I used Wendy Vecchi's White Embossing Paste through the Gothic Stencil onto maroon felt. 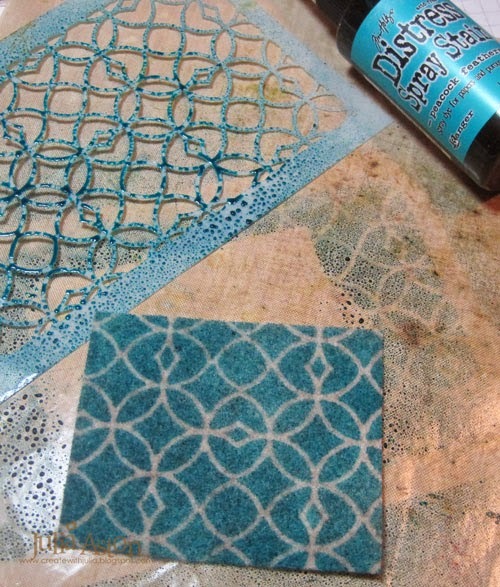 I was surprised the stenciling came out so clear on this - and the texture is wonderful! 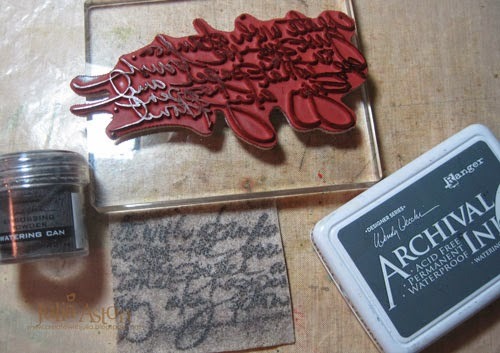 Next up is embossing onto felt - this came out much better than I thought it would- but the embossing powder sort of stuck everywhere not just on the inked image - so the text isn't really clear. I used Wendy Vecchi Watering Can Archival Ink and Embossing Powder and a Dina Wakley stamp - Create with Abandon. The felt also shrinks up a bit when you heat it. The next two photos show how you can get different results depending on the color of the product (in this example - Distress Paint) and the color of the felt. Using Rusty Hinge Distress Paint on maroon felt did not produce a clear image. 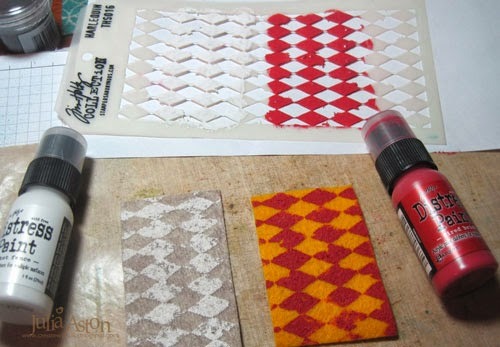 So then I tried Distress Paints through Stencils onto felt. 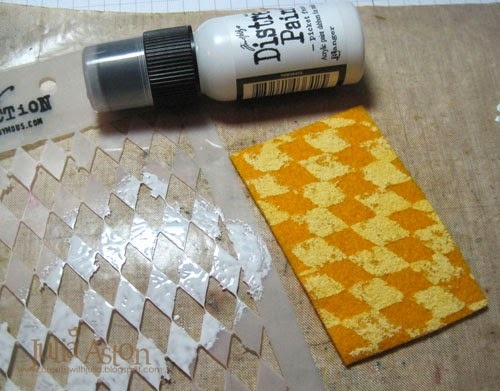 Here is Picket Fence with the Harlequin Stencil on orange felt - I was surprised that the white paint showed yellow on the felt - another outcome you wouldn't know until you tried it. My next photo shows how the Picket Fence Distress paint shows true on tan felt as does the Fired Brick on orange felt. I hot glued the center piece to the tip of a toothpick and wrapped it around adjusting it until I liked the shape. I added hot glue to the bottom. Then I had to add some hot glue on a few of the layers to hold them together. I cut off the exposed end of toothpick. 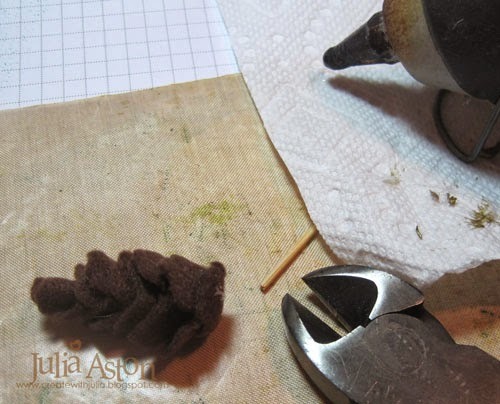 Since this felt pine cone was so successful - I moved right into making a project with them. 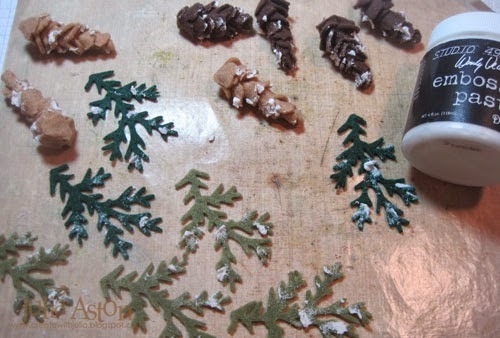 I made several pine cones in tan and dark brown felt and also cut out the fern on the same die in two different colors of green. 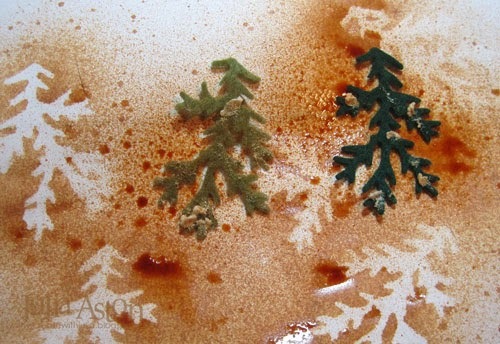 I added dots of white Embossing Paste with my finger to look like snow. I embossed Letter Press letters with Wendy Vecchi Fern Green and Tree Branch inks and Fern and Tree Branch embossing powders. and did the same to the pine cones. I made a base for my project using a 4" x 6" Burlap Panel. I laid a piece of Melange Tissue Wrap over the top and covered it with Gesso. When dry I sprayed it with Brushed Pewter Distress Spray Stain (effectively removing any hint of the pattern of the tissue wrap under it!) 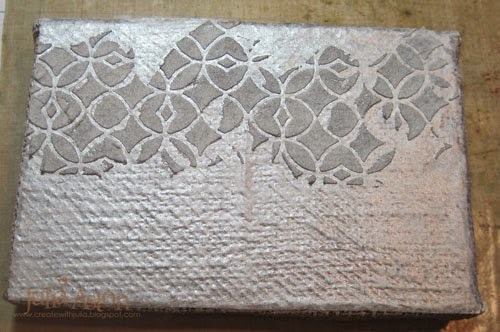 And then I used white embossing paste through the Lattice Work Stencil along the top half. 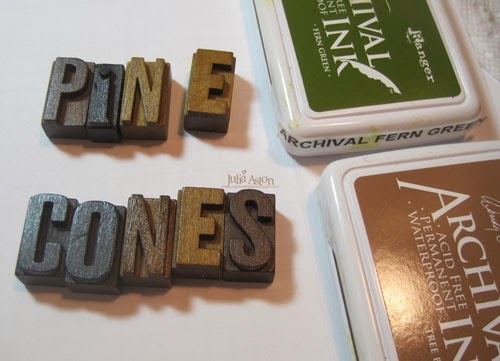 After that dried - I adhered my pine cones and branches around the edges and the Letter Press words in the open space. 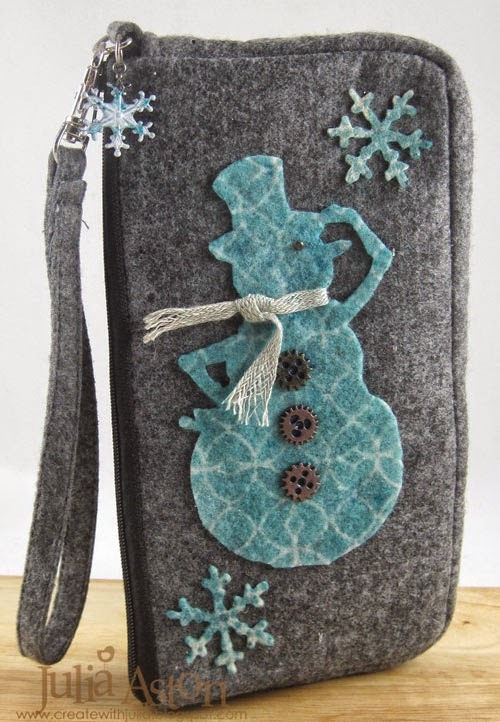 I decorated an 8" x 4 1/4" felt purse that I purchased at Joann's, using tan felt, the Winter Wonder Die, Lattice Work and Dot Fade Stencils, Snowflake Adornment, Linen Ribbon, Mini Fasteners (the eye) Mini Gears, Peacock Feathers Distress Spray Stain and Picket Fence Distress Paint. I adhered the felt to the bag with Scotch Quick Dry Adhesive. And finally, I decorated a 5" x 7" burlap bag. I used Tim's Frayed Fabric Technique for the base of this project - found on page 66 of Compendium of Curiosities Vol III - the Ornate Frame die, an old Sizzix Heart die, Heart Charm, Ring Fastener, Arrow, Stripes Stencil and Picket Fence Spray Stain. 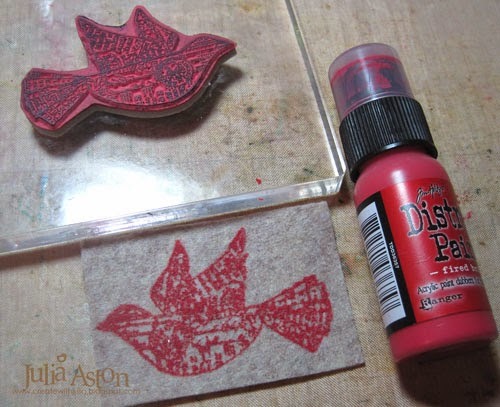 I hope I have inspired you to try new ways to use all of your stamping/crafting supplies (including felt!) . As Tim wrote in my copy of Compendium of Curiosities Vol I - "Stay Curious!" Thanks so much for stopping by at A Vintage Journey today! 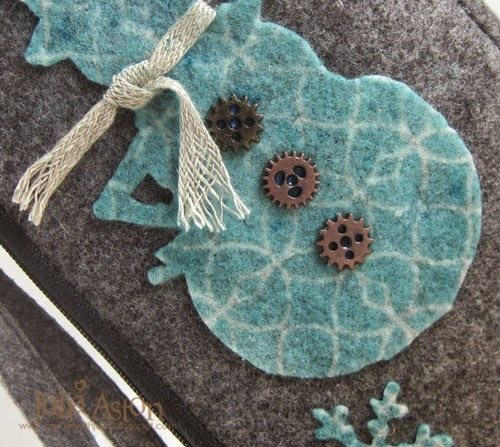 What a great project, gorgeous use of the felt. 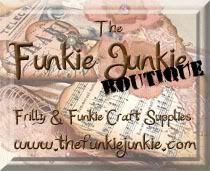 Wonderful Julia, I never would have thought to stencil or stamp onto felt but your results are fabulous. 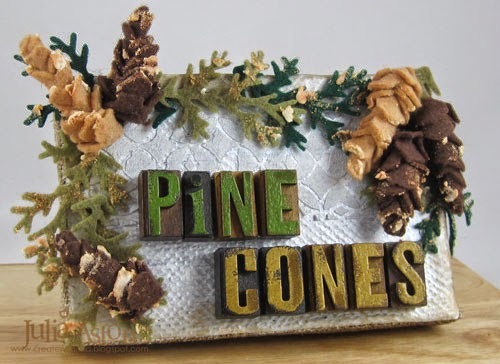 Love your pine cones panel and the snowman purse and burlap bag are beautiful! This is so clever Julia! I loved following your different experiments and the finished results, reach one of them, looks fantastic! I am not a fabric person (sewing machine and I don't like each other) but this is such a fantastic idea, I think even I could manage.... thanks for the inspiration!! 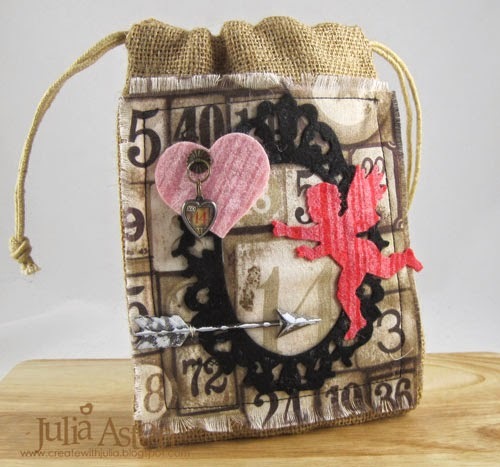 Absolutely LOVE your projects Julia! Very inspiring DI post Julia. Love the techniques and outcomes. Fabulous finished projects too. A great DI post Julia with great steps. Love your snowman and pine cones. 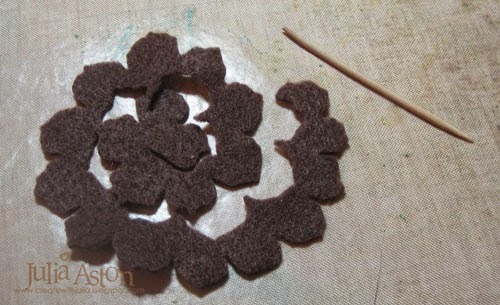 I have used the Spray stains on felt for flowers but never thought of using with a stencil, must try this. Way to go Julia! 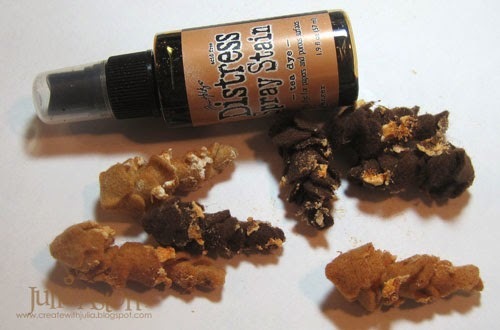 Such a great DI post and the Pine Cones altered Burlap panel is wonderful. Love all the projects! Such great information and photos Julia. I would have never thought of some of the techniques you used here and they turned out great. Thanks. 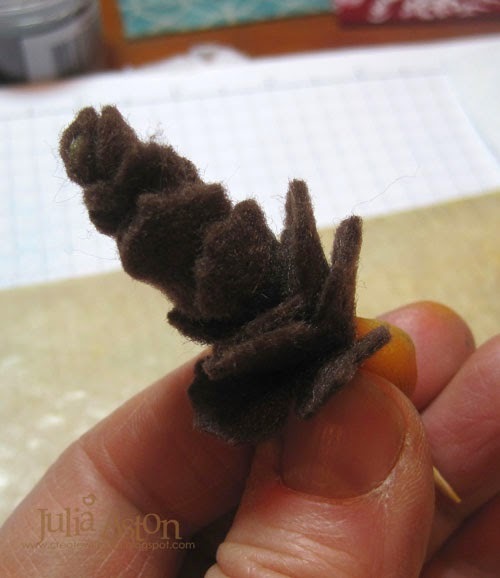 Julia, what a great, informative post, and lovely projects, too! I love how that Picket Fence turned yellow and the maroon felt with texture paste looks like a keeper for a future project! Thank you for all your hard work, here and the wonderful tutorial!